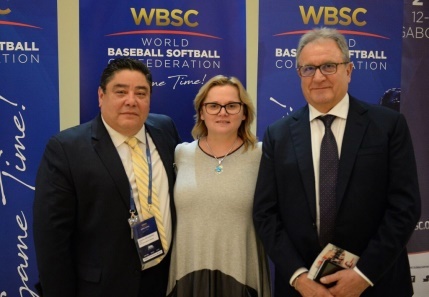 October 14, 2017 Puerto Rico’s Tommy Velazquez is the new Chairman of WBSC Softball Division. He was elected with 51 votes against 34 received by incumbent Chairman Dale McMann (Canada). McMann was the first to congratulate Velazquez: “I am sure he will do a great job”. McMann’s farewell at the WBSC Softball Congress in Gaborone, Botswana, was an emotional one: “It was my honor and my privilege serving the organization for 24 years”. Tommy Velazquez is the President of CONPASA (Confederacion Panamericana de Softbal) and leads his home country Federation. Javier Anaya (Colombia) was elected Treasurer unopposed. Beng Choo Low (Malaysia) was elected first Vice President with 47 votes out of 85 in the first round, while Craig Cress (United States) received 64 votes in the second round over incumbent Darryl Clout (Australia) and was elected second vice President. The election of the 3 members at large required more time and engaged the delegates in different rounds of votes. Maria Soto (Venezuela) was elected first member at large. Taeko Utsugi (Japan) was elected second member at large and Tirelo Mukokomani was elected third member at large. “We had a long day” said Velazquez in his first speech as Chairman. I really want to thank this Congress for trusting me so much. I find it an excellent opportunity. Above all, I want to work together with Europe. We need to have a very clear goal: Paris 2024, it’s a key to our future. Before I go, I want to say that we are all on the same team and this team is the game of softball. Game Time”.